In The Bro Code and Generation M, filmmaker Thomas Keith examined how American culture bombards young men with sexist and misogynistic messages. In The Empathy Gap, he looks more closely at the ways these messages short-circuit men's ability to empathize with women, respect them as equals, and take feminism seriously. 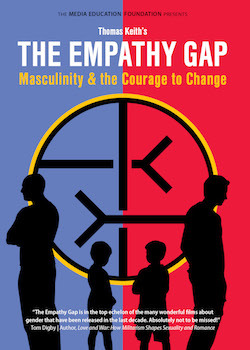 Keith begins by exploring some of the key messages about manhood that boys absorb from the culture -- that they should acquire material wealth, meet conflict with aggression, harden themselves, suppress all human emotion except anger, and view women primarily as sexual objects -- then argues that these messages not only devalue women but also undercut men's innate capacity for caring and empathy. Along the way, he draws fascinating parallels between sexism and racism, spelling out how each is rooted in cultural norms that discourage empathy, and shows how men who break with these norms live happier and healthier lives. Features Jennifer Siebel Newsom, Tony Porter, Michael Messner, Derrick Jensen, Kevin Powell, J.W. Wiley, Charlotte Watson, Eddie Moore Jr., C.J. Pascoe, Julia T. Wood, and others. Dr. Thomas Keith teaches philosophy and gender studies at California State Polytechnic University, Pomona. He specializes in American philosophy and pragmatism with an emphasis on issues of race, class, and gender. In 2008 and 2011 respectively, Dr. Keith directed and produced Generation M: Misogyny in Media & Culture and The Bro Code: How Contemporary Culture Creates Sexist Men, which are used in classrooms around the world. Dr. Keith's forthcoming book is Masculinities in Contemporary American Culture: Confronting Complexities and Challenges of Male Identity (Routledge Press) is scheduled for release in July 2016. E-mail Dr. Thomas Keith. To book Thomas Keith for a speaking engagement, contact Leslie.